RADNOR TOWNSHIP, Pa. — The University of Pennsylvania Health System (Penn Medicine) recently received preliminary land development approval from Radnor Township officials for the development of a new $200 million, 250,000 square foot medical facility and 1,000-vehicle garage along Interstate 476 in this Philadelphia suburb. The property, at 145 King of Prussia Road, is on the site of a former Wyeth-Ayerst Pharmaceuticals Inc. campus. Local news media reports that Penn Medicine, which acquired the property for $35 million in May 2015, plans to sell the property to a third-party developer and lease back the medical office building (MOB) space. In addition to the new medical office building (MOB), plans calls for about half of the property to be sold for the development of a hotel and office complex totaling up to 225,000 square feet. Quoted in the local Philadelphia Business Journal, Kevin Mahoney, executive VP and chief administrative officer at Penn Medicine, said that the system has received proposals from five developers. The names of the developers were not disclosed. Local news media reports that site work is already underway and that Penn Medicine plans to seek final approval in late spring and to start construction this fall. 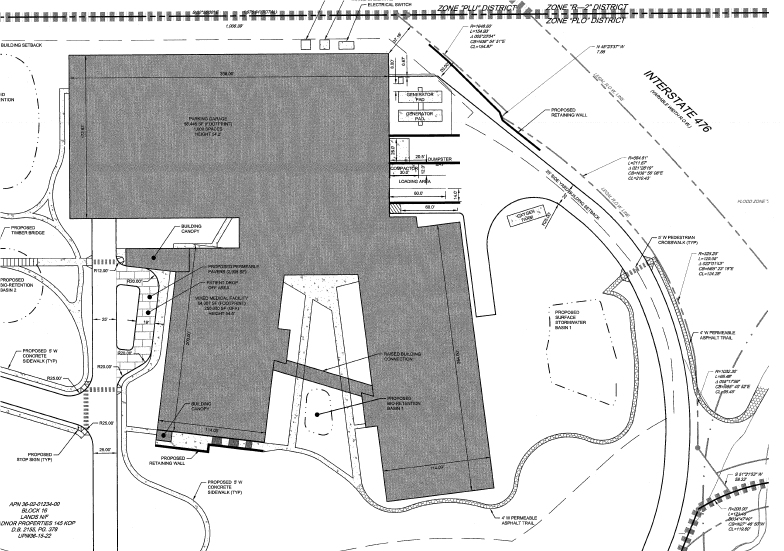 Penn Medicine already owns a 170,000 square foot MOB nearby at 250 King of Prussia Road. It bought the building for a reported $13 million in 1995, and repurposed what had been TV Guide magazine’s corporate headquarters for use as an MOB. Penn Medicine reportedly plans to sell the former TV Guide building, but says it would probably lease space there until the new MOB is completed. Some business and back office functions would be relocated from the 250 building to other leased space. If the Penn Medicine plans come to fruition, it would end a string of unsuccessful and sometimes locally opposed attempts to reuse the former Wyeth property, which includes five buildings built from 1952 to 1982, with a total of 374,387 square feet of lab, office and warehouse space. The property has changed hands several times during the past 17 years. In 2001, a predecessor to what is now Rubenstein Partners, a Philadelphia real estate company, bought the property as Wyeth was transitioning away from the campus and rebranded it as an office park. When that project didn’t turn out to be a good fit, Rubenstein sold the property to BioMed Realty Trust in 2004 for $87.9 million. But BioMed lost its anchor tenant in 2006 and was unable to re-lease the space or gain approval for a new mixed-use project at the site. BioMed sold the property to Penn Medicine in May 2015 — taking a $32 million loss on the asset.